Bu çalışmada Türkiye ekonomisi için savunma harcamalarının ekonomik büyüme, enflasyon, cari işlemler dengesi, ithalat ve istihdam gibi makro büyüklükler üzerindeki etkisi araştırılmıştır. Söz konusu ilişki 1980-2016 dönemi üzerinden yapısal kırılmalı birim kök testi, Granger ve Toda-Yamamoto nedensellik testleriyle analiz edilmiştir. Çalışma sonucunda savunma harcamalarının enflasyon, cari işlemler dengesi ve ithalat üzerinde etkili olduğu tespit edilmiştir. Aynı testlerin uygulandığı önceki çalışmalardan farklı olarak, bu makalede cari işlemler dengesinden GSYİH'e ve savunma harcamalarına nedensellik belirlenmiştir. Kanıtlar Türkiye ekonomisinde savunma harcamalarının makro ekonomik değişkenler üzerinde etkisi olduğunu göstermektedir. 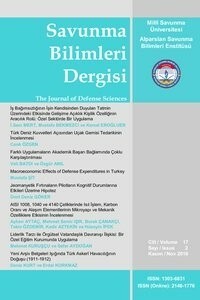 In this study, the effects of defense expenditure on the macroeconomic majorities of Turkey such as economic growth, inflation, current account balance, import and employment have been investigated. The relation in question has been analysed over the period between 1980-2016 by structural breaks unit root test, causality tests of Toda-Yamamoto and Granger. As a result of this study, it has been detected that defense expenditures are effective on inflation, current account balance and import. Unlike previous studies which same tests were applied, causality from current account balance and GDP to defense expenditures was determined in this article. Evidence has shown that, for Turkish economy, defense expenditures are effective on macroeconomics variables. Eshay, E. (1983). Fiscal and Monetary Policies and Problems in Developing Countries. Cambridge: Cambridge University Press. Pesaran, H. M., and B. Pesaran. 2009. Microfit 5.0. Oxford: Oxford University Press. Aiyedogbon, J. O., & Ohwofasa, B. O. (2014). Impact of Military Expenditure on Inflation in Nigeria 1980-2012, Review of Arts and Humanities, Vol. 3, No. 2, pp. 01-17. Anfofum, A. A. (2013). Macroeconomic Determinants of Defence Expenditure in Nigeria (1970-2011). International Journal of Business and Social Science,4(9). Anfofum, A., Andow, H., & Mohammed, A. (2014). Military spending and external debt burden in Nigeria. International Journal of Education and Research, 2(7), 611-626. Azam M., Khan F., Zaman K., Rasli A. (2016), Military Expenditures and Unemployment Nexus for Selected South Asian Countries, Social Indicators Research, Vol: 127, Issue 3, pp 1103-1117. Bayat T., Kayhan S., Şentürk M., (2012), Budget Deficits and Interest Rates: An Empirical Analysis for Turkey, Eurasian Journal of Business and Economics, 5 (9), 119-128. Benoit, E. (1978), Growth and Defense in Developing Countries, Economic Development and Cultural Change, 26: 271-280. Cheung, Y. W., & Lai, K. S. (1995). Lag order and critical values of the augmented Dickey–Fuller test. Journal of Business & Economic Statistics,13(3), 277-280. Dickey, D. A., & Fuller, W. A. (1979), Distribution of the estimators for autoregressive time series with a unit root. Journal of the American statistical association, 74(366a), 427-431. Dritsakis, N. (2004). Defense spending and economic growth: an empirical investigation for Greece and Turkey. Journal of Policy Modeling, 26(2), 249-264. Dunne, Paul, Eftychia Nikolaidou and Dimitrios Vougas, (2001), Defence Spending and Economic Growth: A Causal Analysis for Greece and Turkey, Defence and Peace Economics, Vol: 12, No:1, pp.5-26. Dunne, J. P., Smith, R. P., & Willenbockel, D. (2005). Models of military expenditure and growth: A critical review. Defence and peace economics, 16(6), 449-461. Glynn, J., Perera, N., & Verma, R. (2007). Unit root tests and structural breaks: a survey with applications, Revista De Metodos Cuantitativos Para La Economia (3) pp:63-79. Hall, A. (1994). Testing for a unit root in time series with pretest data-based model selection. Journal of Business & Economic Statistics, 12(4), 461-470. İpek, E. (2014). Savunma Harcamalarının Seçilmiş Makroekonomik Değişkenler Üzerine Etkisi: ARDL Sınır Testi Yaklaşımı, Anadolu Üniversitesi Sosyal Bilimler Dergisi, 14(3). Karagöl, E. Palaz S, (2004) Does Defence Expenditure Deter Economic Growth in Turkey? A Cointegration Analysis, Defence and Peace Economics, Vol:15, No:3, , pp. 289-298. Kollias, C. (1997), Defence Spending and Growth in Turkey 1954-1993: A Causal Analysis, Defence and Peace Economics, Vol: 8, No:2, pp.189-204. Looney, R. E. (1997). Excessive defense expenditures and economic stabilization: The case of Pakistan, Journal of Policy Modeling, 19 (4), 381- 406. Oyinlola, O. (1993). Nigeria's National Defence Spending and Economic Development: An Impact Analysis. Scandinavian Journal of Development Alternatives, 12(2-3), 241-254. Özsoy, O., & İpek, E. (2010). The Relationship Between Defense Spending and Macroeconomic Variables. International Journal of Economics and Finance Studies, 2(1), 103-111. Paparas, D., Richter, C., & Paparas, A. (2016). Military Spending and economic growth in Greece and the Arms Race between Greece and Turkey. Journal of Economics Library, 3(1), 38-56. Perron, P. (1989). The great crash, the oil price shock, and the unit root hypothesis. Econometrica: Journal of the Econometric Society, 1361-1401. Soyyiğit Kaya S. (2013), Türkiye’de Savunma Harcamalarının İktisadi Etkileri Üzerine Nedensellik Analizi (1970-2010). Trakya Üniversitesi Sosyal Bilimler Dergisi 15(2). Toda, H., Y., Yamamoto, T., (1995), “Statistical Inference in Vector Autoregressions with Possibly Integrated Processes”, Journal of Econometrics, 66, pp. 225-250. Vadlamannati, K. C. (2008). Exploring the relationship between military spending & income inequality in South Asia. In William Davidson Institute Working Paper No. 918. Wijeweera, A. and Webb, M.J. (2009); “Military Spending and Economic Growth in Sri Lanka: A Time Series Analysis”. Defence and Peace Economics, 20(6): 499-508. Yıldırım J. Sezgin S,(2003), Military Expenditure and Employment in Turkey”, Defence and Peace Economics, Vol: 14, No:2, pp.129-139. Zivot Eric, D. Andrews, (1992), ‘‘Further Evidence On The Great Crash, The Oil Price Shock, and The Unit Root Hypothesis, Journal of Business & Economic Statistics, vol. 10, no. 3, pp.251-270. SIPRI, (2016) SIPRI Military Expenditure Database. https://www.sipri.org/sites/default/files/SIPRI-NATO-milex-data-1949-2015.xlsx 09.09.2017. TCMB, (2016), Elektronik Veri Dağıtım Sistemi, http://evds.tcmb.gov.tr/ 09.09.2017.